This is a delight in late summer to early fall. Violet purple fruit clusters appear in autumn, following soft lavender fuzzy flowers. The fruit remains on the stems after the foliage drops to make a great show, often well into winter. It forms an upright arching shrub, that responds well to light pruning as the flower are produced on new wood. 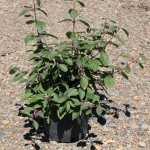 The new growth is bronze purple; summer foliage is dark green. 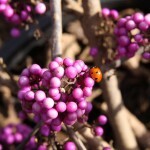 This selection is self-fertile and will produce a reliable crop of berries.